"The Ful-Vue camera is really a very simple camera. It consists of a light-tight box. In front of the box there is a hole, over which the lens is fixed. Behind this hole is the shutter. There is a second lens in a second box above it. This produces a picture on the viewfinder on top of the camera. In the back of the box is another hole covered by a red window. This helps you in winding the film on, which you do by the knob at the side of the box near the top." [Marcel Natkin]. 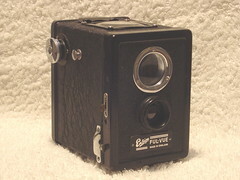 The earliest Ful-Vue version of 1939 was a typical box camera with back door, but already having the characteristic big viewfinder. Like other box cameras it had a back door and an inner camera part which could be taken out of the box to load the film. Pictures were 6×6cm on 120 film. The cameras had two shutter settings; instant which was 1/30th of a second and time which kept the shutter open until you pressed it again, all later models are the same. 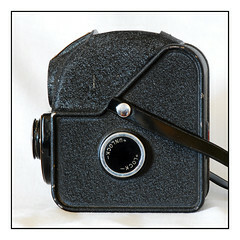 In 1946 the camera was redesigned, getting away from average box camera design. 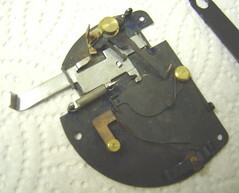 Then the inner part of the camera was fixed to the side panel with the film winding knob. The whole unit could be pulled out of the camera sideways after unlocking it with the knob on the other side panel. Focusing was possible by pulling the lens out for close exposures. Pictures were 6×6cm on 120 film. An old Barnet-Ensign Ful-Vue may need some manipulation by simply bending the long metal strip that is part of the roll-holder a little bit to achieve the necessary tension of the film. 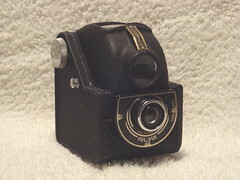 In 1950 further improvements were made, the new flash synchronized shutter, the turn-able lens barrel allowing three different distance settings instead of two, an all-plastic front panel, and an optional flashgun. 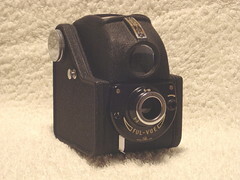 The improved version was called Ful-Vue II. Pictures were 6×6cm on 120 film. 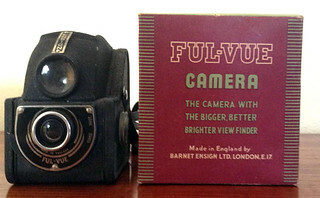 Adrian Richmond states that colored models (red, white and blue) were sold in 1952-3, to celebrate the coronation of Queen Elizabeth II; However, no other evidence for these cameras has been seen: in particular, the Ful-Vue is not mentioned in a coronation advertising supplement to the BJP Almanac of 1953. 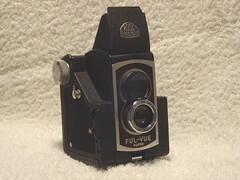 Colored Ful-Vues were advertised as 'Ful-Vue à la Mode' in late 1952. Examples of the regular Ful-Vue II, repainted and presented as the colored model, have been seen in online auctions. 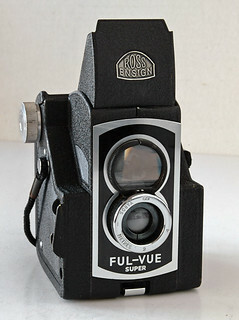 The Ful-Vue II was succeeded in 1954 by the Ross-Ensign Ful-Vue Super, which had a flat front plate extending around both lenses, a cast alloy body (in place of the sheet steel) and a collapsible hood around the viewfinder. The taking lens focused to 2 yards/meters. Its red window was closeable. 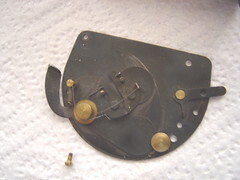 The film loading was made easier again by means of a removable back-and-bottom part which was held just by the clamp on the bottom. 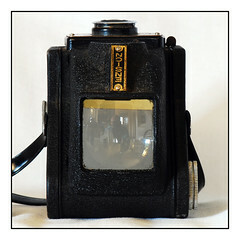 A more elegant flash unit was available, mountable without cable to a side panel of the camera. Pictures were 6×6cm but now using 620 film. The complete Ful-Vue series serves as a model for Through-The-Viewfinder TTV photography, where people use other cameras (mostly digital) to take pictures through their amazingly big viewfinders. 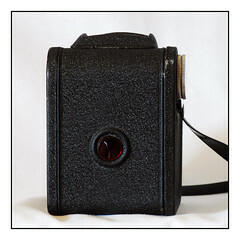 Barnet-Ensign design of 1946 Back with red window The knob to unlock the camera to open it. The big finder. The front. 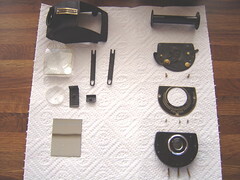 The finder housing with lenses and the retention springs which fix it over the mirror upon the camera body. 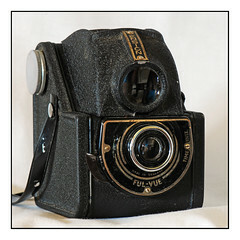 ↑ The Ensign Ful-Vue, at Adrian Richmond's Ensign Camera: a History. 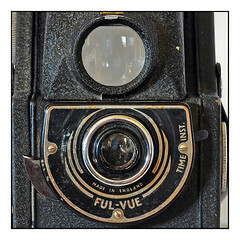 ↑ Flickr discussion post by John-Henry Collinson (Flickr user Colonel Blink) in the Camera-wiki.org group, 30 July 2015, noting some basic features of a genuine coloured Ful-Vue. This page was last edited on 23 October 2018, at 16:30.